The war was older than anyone could remember, as old as the races themselves that fought the ongoing battle to capture territories and claim them as their own. Leone of the House of Lions had fought in many such battles and was a seasoned, proven warrior highly regarded by all. He was very tall and favored Vog Cub armor for his battles. A swordsman’s cap added a bit of a dashing look to his appearance. He was equally parts kidded and admired for his stylish appearance. His success as a Knight earned him a considerable sum of crowns, which he spent and invested wisely. Consequently, he was able to buy weapons and gear of the highest and rarest quality. The weapon-smiths employed a form of magic that enabled them to increase a weapon’s speed and effectiveness. Thus, Leone was able to buy some of the finest weapons in the kingdom. His personal favorite was his Glacius sword. Lately Leone’s feelings about the war had changed, however. His passion for slaying Red Dragons had waned and been replaced by feelings of, what? empathy? understanding? admiration even? As Leone led his squadron into the mountainside forest, his thoughts and feelings struggled within him. He often chose to serve as party Guardian and healer these days rather as one of its main Strikers. But there was no time for that now, he thought, and firmly shoved those doubts away. It was nearing dusk and the forest was full of shadows. A day prior the Dragons had locked down this territory; Leone was charged with claiming it back. There, in that enclave just ahead, he could see the flag of the House of Dragons planted in the center of the territory. His scout has reported a party of five dragons defending it. It would be an even fight then. Leone signal to his three strikers to take up attack positions. Just then he felt a ping on his radar. They’d been spotted by the Dragon scout. No time to organize; they had to strike while they still enjoyed some element of surprise. His three strikers launched themselves almost simultaneously. Their familiarity with one another allowed them to work in coordination as a unit even with minimal communication. The Dragons responded quickly, but the Lions pressed their advantage mercilessly. One Dragon was already down and another was heavily damaged, but with Leone holding back from the fray, it was four against four. One Dragon, a bit shorter than the others, wheeled quickly left and right, weaving a fiery trail figure-8 from the fiery crown she wore on her head. Leone watched mesmerized by her skill until he noticed two of his Lions were down. He moved around trying to flank her. He swung at her with his Glacius, testing her more than actually trying to hurt her. She flicked his blade aside before delivering a critical hit, Ding!, against the last Lion standing, just as she was the last of the Dragons. She spun quickly on him, and with a hissss and flick of her tail, made several rapid burning strokes at him with her powerful Combuster. He parried and retreated a step before pressing forward again. They both had swords of great power with skill to match, and the fiery and icy natures of their weapons were having a nullifying effect on one another. They broke off their dual and eyed one another from a safe distance. Leone used the respite to look over his enemy. Her halo, armor and skill marked her as more than an ordinary Dragon. Could she be the Dragon Princess herself? If so, it was something of an honor to meet her in combat. “Yes, I am Mawashimono, the Dragon Princess, and I’ll be the last Dragon you ever see!” She switched weapons, leveled an Argent Peacemaker at him, and rapidly fired off several shots. Leone felt a bullet singe his ear as he dropped and rolled, coming up with his Polaris, which he fired back. His quick reaction time caught her by surprise as she barely raised her fiery dragon scale shield in time to block the shots. Still, the force of the impact of the charges drove her backwards several meters. She realized that he was just too powerful for her to take down by herself, especially in his heavily fortified Vog Cub armor. With a burst of magic crystal energy, she transformed into her Radiant Silvermail battle armor, and equipped her head with a Heaven Iron Helm. Once again she fired off several shot from her Peacemaker, but only to give herself time to close on him with her sword. Her plan nearly worked, not so much for the speed with which she conducted it, but rather for her glorious transformation. Her fiery crown had been replaced by an iron one of her own personal color, and the setting sun glinting through the trees and reflecting off her shiny golden armor was nearly breathtaking in its beauty. She rushed him but could not quite get past his cold steel Glacius. He changed to his Snarbolax Coat to counter her magical metamorphis. Her forward momentum carried her into him and they collided solidly. The Dragon Princess let out a small, high-pitched grunt at the impact. It was then she realized how very tall he truly was. She looked up and felt a vertigo threatening to overwhelm her. Never had she seen such soulful, glowing eyes. Pressed up against him she could smell his beastly muskiness. Her nostrils flared and she snapped her teeth at him. He leaned back but held her fast, and a smile touched his lips. “We seem to be at an impasse,” he chuckled. “Unhand me, milord, and I’ll break it!” she glared. Slowly he released his grip on her but he did not raise his sword even as she raised hers. He had left himself open, and she could have struck him down had she so desired. But strangely, it was not his death she desired, but rather the warrior himself. What strange new magic was this? Leone slowly slid his hand into his coat pocket. Mawashimono tensed, not knowing what this mysteriously handsome Lion might do next. His hand emerged from his pocket bearing a solitary fancy flower. “For you, milady. Something to remember me by until we meet again.” The Dragon Princess twitched her wings but could not quite bring herself to extend a long-nailed hand to receive it. Since they were still quite close, Leone gently reached across and attached the flower to her helm. As he withdrew his hand, he lightly caressed her cheek. Mawashimono involuntarily closed her eyes and rubbed her jaw against his retreating hand. When she finally opened them again, Leone had departed, leaving only a dark vapory trail and a promise of future intriguing entwinement. “My, Leone, you’ve been quite the busy Clockworks delver lately. Saving up money for another costume?“ his friend, The Bard ribbed him. “Yep. Got a real nice one planned!” Leone smiled. “You always do,” The Bard responded with a smirk. The truth was he’d been making numerous forays into Clockworks in hopes of the slimmest chance of meeting up with “her”. Although the various clans and guilds fought for territory on the surface of the planet, underneath was quite a different story. In the Clockworks, knights regardless of clan fought side by side against the monsters below for the mutual benefit of gaining crystals, minerals, and other valuable treasures that lie below. By joining various random party groups, Leone was hoping he might luck into one with Mawashimono. The odds against made it a fool’s quest, but perhaps his . . . (love?) feelings for her had turned him into one. Mawashimono had lost her desire for glory in locking down control points for territory. Her heart was conflicted and troubled, and thus she made for rather poor company these days. Consequently, she spent most of her time soloing the Clockworks depths, at least trying to make herself useful until she could regain some peace in her spirit. She was taking some damage but managing alright, Blast those reavers! “Back you foul fiends! Get . . . a . . . way . . . from me.” Each word accompanied by a sword swing. Second wave done, just one more to go. Two Trojans appeared, one just out of view. She was maneuvering one into position and never saw the club coming as the second Trojan hit her. Wham! She tried to stagger away, but it was like walking through hip-high mud. Not enough room to maneuver, blast it. Wham! The first Trojan had hit her as well. As stars swam before her eyes, she could feel her life force slipping away. The last thing she saw was a vision of Leone, whose image had played over and over in her mind so often these past few weeks. She regretted not having a chance to say goodbye to him. Leone joined yet another PUG party with very little hope in his heart of finding her, but he would not give up, he knew that now, knew that at some point he had turned a corner in his hearts and could never go back, nor was it his desire to. As he appeared in the Clockworks he was immediately greeted by a cacophony of noise. Two Trojans were snorting in delight while devilites danced around with arms upraised. In the middle of this was a bent over figure, staggering or falling, he could not tell. Leone switched out his Final Flourish and quickly dispensed a Trojan with its back turned toward him. The second became aware of this new threat and move powerfully toward him. Leone let it begin its attack, side stepped and whirled before slash-slash-slashing its vulnerable back jewel. The Devilites howled in anger at the intrusion of this new foe, and begin hurling their shock balls in his direction. Leone patiently shielded while advancing, and with the same sword that had done in the Trojans, methodically whittled down their numbers until he had skewered the last of them. He was now able to see to the fallen fighter who had been so near to death. He sucked in his breath sharply at the sight of his beloved Dragon Princess. She had been beaten and bloodied, and hovered within lethal limits of her health expiring. Gently he raised her up. “And mine too, Leone. I’ve been hoping we could become . . . friends.” She tried to smile then winced at the pain she still felt in her mouth. Leone stood to his full height. “Who is this fellow? Perhaps I could have a word with him,” and he gripped his sword meaningfully. “No, Leone, you can’t do . . .” She stopped mid sentence. That was not quite true. There was a moment in the wedding when anyone with any objection could speak up, and if so desired, even challenge the groom for the hand of the bride. She had heard stories of this happening, but not to anyone she ever knew nor in any wedding in her city. She looked into Leone’s glowing eyes trying to decide whether or not to share this information with him. Not that it would do any good, since the cultural laws of Dragons did not apply to Beasts of any kind, naturally. “Very well,” he smiled, “friends then.” For now, he thought to himself. The last two months going on runs in the Clockworks with Leone had been wonderful, and they had grown quite close as friends. But now here wedding day was upon her, a day her parents had been planning for her for years, and she knew she would be forced to give up battling by Leone’s side. Such a life might be acceptable for a young princess, but not for a married one. Her friends and family were in a festive mood, and Mawashimono tried her best to match it. She smiled at her mother and her father, whom she loved dearly, and tried to be happy for their benefit. Leone had been gathering information on the wedding arrangements and about the layout and entrance points to the Dragon City. He had carefully hidden his intentions from Mawa since he did not want to upset her or try to counter-argue against her objections. He was risking his life, perhaps even throwing it away on a useless cause, but he could not live with himself if he didn’t try. His only real fear was that he might spoil what is usually a very special day in a young female’s life. He had disguised himself as one of the merchant Strangers that are allowed to roam freely from city to city. Even with his very tall height he was shorter than most Strangers, but his heavy stranger hat and matching Chaos Cloak with a belly barrel would have to suffice. As he hoped, getting into the city had not been too difficult. Getting close enough at the wedding would be much more challenging. Mawashimono had commented in the heat of battles how pungent his beastly muskiness could be, but she seemed to rather like it. In order to disguise it, however, he had sprayed on some Dragon pheromones that The Bard had obtained for him. The sound of the wedding festivities made it easy enough to locate the wedding, and Leone began to move towards it as unobtrusively as possible. The Dragon Princess now stood up on a stage next to Red-Rascal in front of the wedding crowd. The wedding minister had come to the part in the ceremony which Mawa had told Leone about. She thought of him especially then, though truth be told, she hardly ever stopped thinking about him. “I do,” a voice rang out. All heads turned and look at the Stranger who had shouted the words. The crowd of aristocratic Dragons erupted in protest at the presence of a Lion among them, several hissing and snapping their teeth in unseemly decorum. Guards immediately rushed to seize Leone. “What is the meaning of this?” Red-Rascal asked spat.” He turned to Mawa with the question and annoyance on his face. “Princess?” he asked her. Mawashimono was simultaneously overjoyed and dismayed. What had Leone done? Didn’t he know win or lose, he’d never be allowed to leave here alive? As the bride being challenged for, it was still her right to refuse to allow the challenge. No face would be lost to anyone involved and the wedding could proceed. If Leone were a Dragon, that is. But this was unheard of. She looked to Leone again, and the love she felt in her heart for him flowed out through her tears. By allowing the challenge she had humiliated her groom and shamed her parents, and this in front of all the noble Dragons of the city. There was no turning back now. She said the words again, louder now and with more conviction as she realized that her future, if she even had one left, with be with Leone the Lion or with no one at all. “I allow the challenge!” she repeated. Red-Rascal transformed into his battle gear as Leone did his. Rather than offer any of the usual polite formalities that Dragons might accord one another, Red immediately launched his attack against Leone. Giving Leone no time to recover, Red pressed his attack aggressively, hoping for a quick and decisive victory to impress the assemblage with. But Leone was able to match his speed and weaponry, while enjoying a slight advantage in reach and strength. Inexorably the tide of the fight turned with Red fighting mainly in defense. In desperation, Red quickly tossed two bombs toward Leone, a thoughtless and dangerous tactic with a crowd of people so near to the combat. Leone deflected one with his shield and batted the other back towards Red-Rascal. Red tried to jump clear but was caught partially in the blast and knocked unconscious. Leone now had the right to finish the duel lethally, but wisely chose not to, nor did he harbor any enmity toward the Royal prince who had been promised the hand of his love. Mawa was likewise at a loss for how things were supposed to proceed, so she followed his lead. “And I accept.” She ran to him then, as she had longed to do the moment he had revealed himself. They embraced and sealed their “marriage” with a kiss, and really there was nothing more that anyone could say about it. She knew that they would have to leave the city, that her life here was over forever. She would miss her family and friends, but a new life lay ahead of her, a life in Haven with Leone. 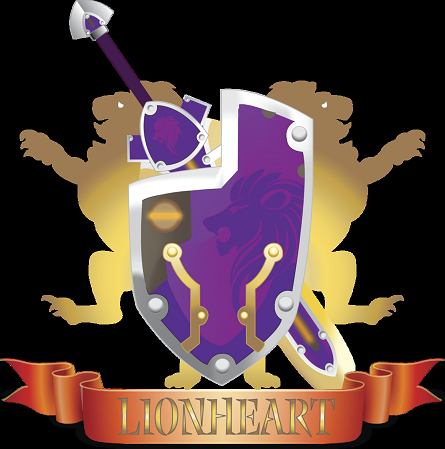 With no guild to call their own, they would have to make one for themselves – a guild where all races would feel welcome and valued equally, a guild that would one day become known as Lionheart. St-Leone and Mawashimono journeyed out of the Dragon Kingdom with a mixture of excitement and trepidation. Although Leo had spent a considerable amount of time hunting in the woods, Mawa had little experience out on her own. She had led attack parties, but knew that her kingdom and family would be waiting for her upon her return. For Leo, life in the woods was neither new nor difficult for him, but leaving his pack, hi Lion’s pride, was another matter. Dragons could live solitary lives, but for lions, it was contrary to their nature. Fortunately, they had each other to ease the pain of leaving loved ones behind. The journey to Haven gave them time to know one another and bond more. They spent many miles conversing about life and hopes and past experiences while walking the many leagues to what would become their new home. It was a sweet time, hardly soured at all but the occasional bad weather, attacking monsters, or Gremlin bandits. They grew stronger in their relationship and as seasoned warriors. Haven was a bustling community with some knights running to and fro in an endless frenzy of activity while other lounged by the Town Square fountain or in snipe gardens. Much of the activity centered around the Auction House. Leo and Mawa had come prepared with items to trade. Leo traded wolver skins and set up a shop to craft and sell weapons, while Mawa used her precious jewels and accessories to purchase many of the things they needed to build a home together. Once they had established themselves in the community, they turned their thoughts to their real dream – a guild of their own. There were close to 1,000 guilds in the community, most quite small – a group of friends or elites with similar interests. Some, however, were very large, powerful and prestigious. None were really what Leo and Mawa hoped their guild would be, though. They hoped to build a place where knights of various kinds and levels could come together in a kind and helpful community. the name they chose was one that would become an honored name among swordsmiths – Lionheart. For the Dragon Princess, leading a guild was quite natural. She had grown up educated and trained in the royal court. Ruling was in her blood. She took great delight in recruiting and organizing new members as their guild rapidly grew to be one of the largest. For Leone, things were different. Lions preferred a pride, or group, of close acquaintances. Leo was not a ruler. He had never even been an Alpha male in a Pride, and found the attention and responsibilities a weary burden. In an effort to clear his thoughts a bit, Leo traveled to a distant land he had often heard about as he was growing up. It was even better than he had imagined, and he returned refreshed, but also changed. In truth, he missed home. He missed his pride and the life he had lived with them. He knew he belonged on the battlefield, be fighting monsters or knights of other kingdoms or guilds. He was a warrior, not a ruler, and gradually he realized he would have to leave. But to abandon the Dragon Princess after leading her to this new land, could he find it in himself to do that? He set about building a Guild hall with renewed vigor and passion. He had something of a knack for interiror decorating, and he used nearly of all the vast wealth he had accumulated in order to create what would be his last and parting gift to Mawashimono. She and all the guild members reveled in the splendid atmosphere of their expanded guild hall. Members of other guild often visited and commented on what a lovely guild hall they had. Mawashimono proudly told them of all Leo had done to bring it about. One patroness of the arts and a renowned artist herself, Tevokkia, even hosted one of her awards ceremonies in their spacious and beautiful hall. It was near the end of the year that Leo approached her. “What’s troubling you, Leo?” Mawa asked with concern in her voice. Mawashimono felt a sense of vertigo, as if she were falling from a very high place. With her hand to her mouth, she asked in a trembling voice, “Are you sure that’s what you want, Leo?" Of course, leaving with him to join a lion’s pride was not an option for the Dragon Princess, nor would she ever leave her guildlings who had come to depend on her. But could she do all this without Leo, her love and constant companion on whom she had come to depend on so greatly? They stood hand-in-hand, forehead-to-forehead as they struggled to deal with the feelings that were racing through both of them. “Are you leaving now?” she asked with tears in her eyes and pain in her heart. “Not now, but soon,” he said with quiet somberness. And now she could control her emotions no longer, and rushed from his presence into her inner chambers where she could begin to release the flood of tears that would come out in the days ahead. A few days later, the Lion of Lionheart left her life forever. He found happiness once again hunting and battling with the members of his Pride. And the Dragon Princess found enjoyment and satisfaction in ruling and guiding the guild as she had been born and raised to do. But still, neither of them would ever forget, nor likely ever find again, the joy they had shared in their life and love together. It's sad how everything ended so quickly, for a lion could never soar in the sky with the dragons and where the dragons cannot hunt and live without a care in the world with the lions. Nice story, but is this how it truly happened? Someday I'll write about their adventures on the way, and battles with Gremlins, and crossing the Chasm and other fun stuff.